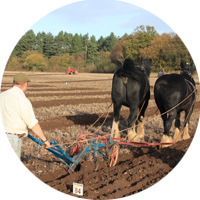 Until the 1930s ploughs were pulled by some form of motive power. The ploughs were “trailed” behind the pulling unit. Early tractors from the end of WWO were merely a substitute for horses! 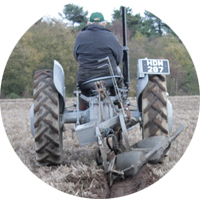 In the 1930’s Harry Ferguson revolutionised ploughing. 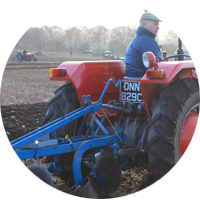 He invented the three point linkage system of attachment to the tractor and a smaller tractor was able to do large acreages of ploughing. 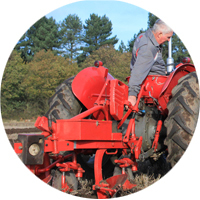 SFPM specialises in its class for Ferguson tractors and Ferguson ploughs – both made before 1956. A pair of magnificent horses pulling a single furrow plough. 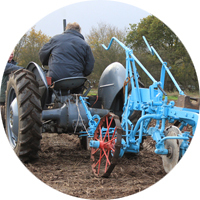 A trailed plough pulled by a vintage tractor, often a Standard Fordson, both made before 1959. 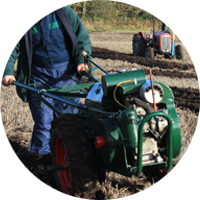 Ploughs attached to a tractor by the 3 point linkage. Tractor and plough made before 1959. Acknowledging that time moves on, this class is for tractors and ploughs up to 1976. 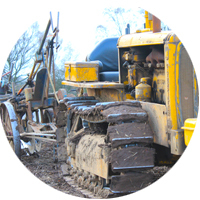 For grey Fergusons and Ferguson ploughs. Let’s not forget the smaller 2 wheel machines used for Market gardens, allotments etc. All made before 1959. 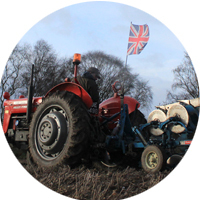 The bridge between modern ploughing and vintage.